The ringing was my phone alarm and it woke me up. The windows were open, it was light outside, and I could hear the sounds of Paris coming alive. The trip across the Atlantic and the day before had taken a toll on me and, I was sertain, the others in our group. I had slept well during the night and I was ready for the new day. I cleaned up and got dressed. Monday, June 14th would be our first full day in Paris. I wanted to make it count, really remember it. I remembered the song that got all of this started and re-read and listened…. How can a day in Paris not be a great day? We met for breakfast and discussed what we wanted to do. We agreed on the Eiffel Tower and decided to meet in the lobby at 10:30 to get going. We got a late start because of me – I held the group back – because I was late finishing what I was working on – the day 15 and 16 post. I will not do that again. Julie decided to take a day of rest and stay back. 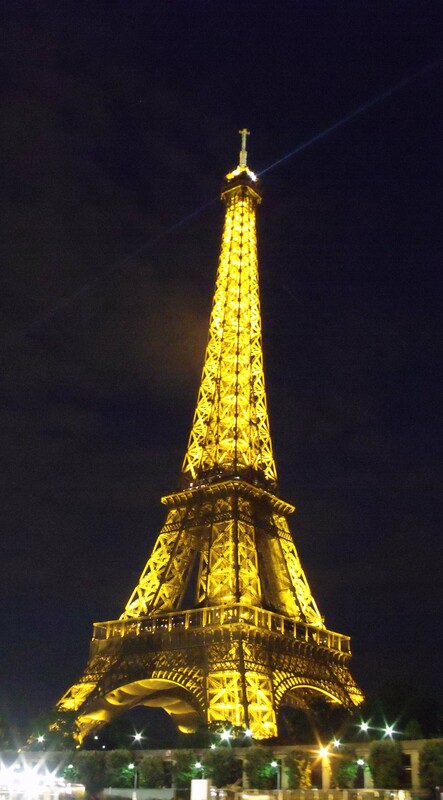 The four of us ventured off toward the Eiffel Tower area around the La Motte – Piquet Grenelle Metro station. This was the area where we had lived in 1966. The street, Rue de Doctor Finlay Grenelle, was a wide boulevard with a Metro track running down the center. The neighborhood with buildings with first floor shops and apartments above rising up on each side resembled a canyon and it was home for us then. I remember the park where we played and the elevated Metro tracks that ran down the middle of the street. We had lived in the area forty-four years ago and it is funny how the mind works. Warren was just three and David not quite a year and a half when we lived in the neighborhood. Their memories were much less develop than mine, yet we walked the area together taking pictures and trying to remember that time long ago when that park was our backyard in the bust city of Paris. Mom still has a drawing I made then of the building, the park, and park benches that I drawn on a tie bag mom had framed and hung in the house where I grew up. My memories of the time also include walks and other trips throughout the city. 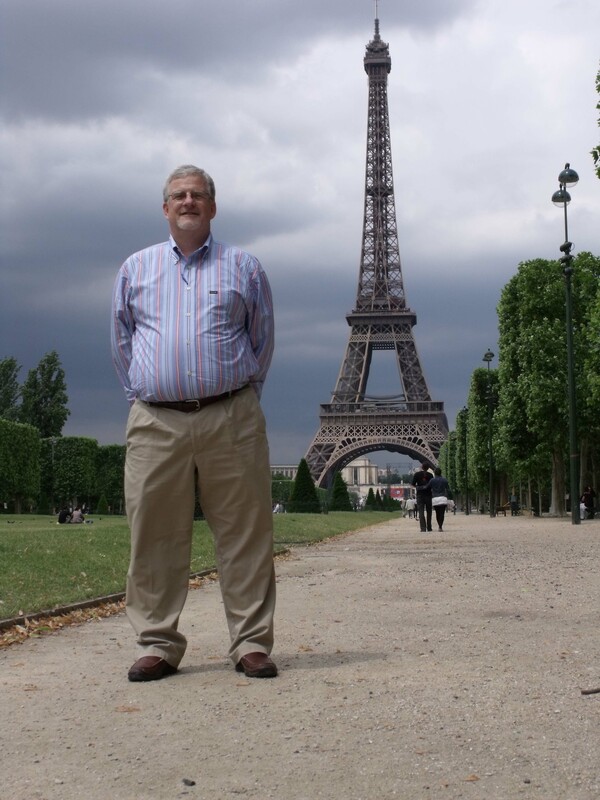 The Eiffel Tower stands tall in Paris and is a wonder to behold. Designed and constructed for the Paris Exposition in 1889 it was once the tallest building in the world. The Champ de Mars, an open parkway lay between Ecole Militaire and the tower itself leading to the Seine. We walked the parkway taking pictures and looking up. The parkway has fine reddish colored gravel, neatly trimmed and bordered squares of grass, perfectly planted trees that divided the space into different parts, and an occasional fountain. Even though it was Monday, the place was busy with people many walking, looking, taking pictures or shooting video and the others who preyed on the visitors. Vendors hawked their trinkets, pictures, and t-shirts. With yesterday’s mutes still fresh on our mind, we ignored the beggars and people who recognize us as visitors. The Roma, gypsies, approached us asking if we speak English only to thrust a card in our faces explaining their plight and begging for coins. Then there are the silent beggars, a couple dressed as an Egyptian mummy and sitting silently on a bench with a cup for coins in front of them. We walk and marvel as the tower gets larger in front of us. We decided not to make the climb or even take the elevator to the top and quickly cross to Seine to avoid the approaching rainstorm and find a place to sit and enjoy a cup of coffee together. After the rain stopped and we finished our coffee, we continued our sightseeing walk. 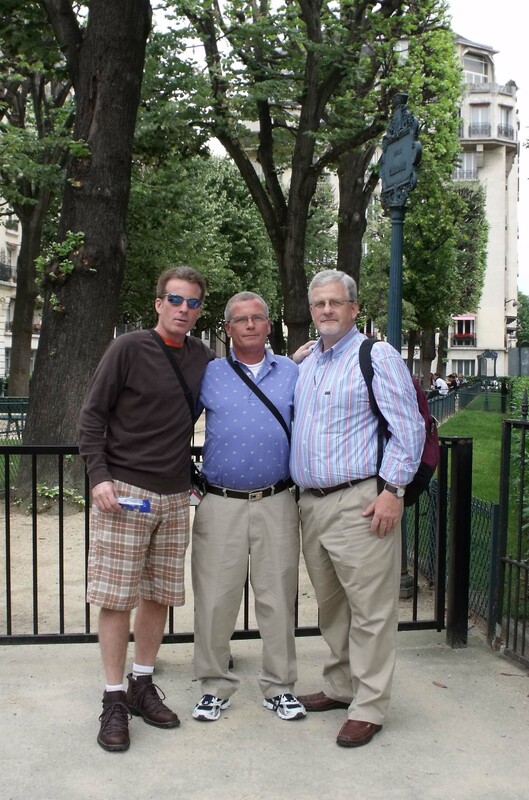 We had already walked quite a bit and we headed toward the Arc de Triomphe. The area we walked though is home to many exclusive shops and expensive apartments. A bakery with a window with beautiful deserts invited us for a look. It was fun to walk, talk, joke, and laugh. Now that we are adults, we do not get much time together to spend sharing as we did as kids. Yet, growing up I remember playing and running our neighborhood together. Family dinners, car rides, and plane trips together to see dad come to mind; but those times are long ago. The Arc de Triomphe seemingly rises out of the tree-lined street in front of us and we trek along the circular streets to get a better vantage point and take the perfect picture. The rain clouds have cleared and it is sunny and bright. 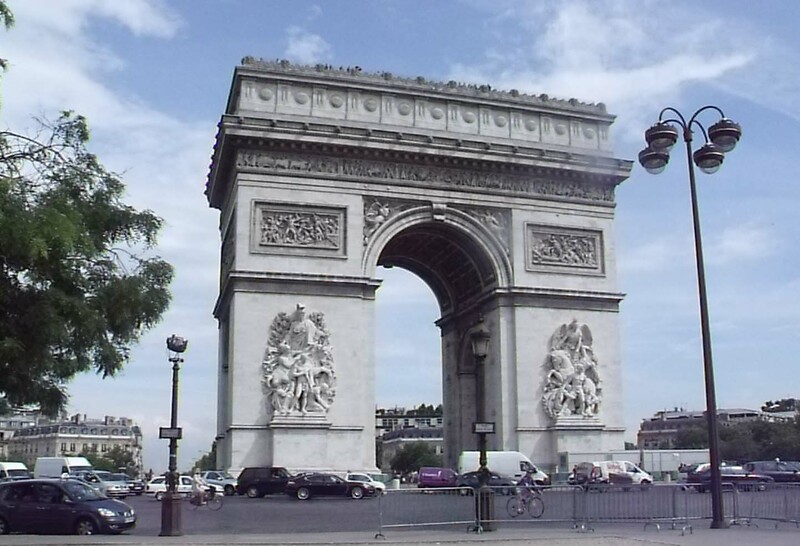 I already have many pictures of the Arc de Triomphe at home; having been here many times, yet none serves justice to the sight before me. We split up. David and Trish head to the center of the circle to find if it is possible to climb to the top of the Arc. Warren is set on finding a cup of coffee, in particular a Starbuck’s. We find neither. David and Trish decide not to climb to the top and rejoin us. It is getting late and we headed back to the hotel to rejoin Julie and make plans for dinner. The Metro returned us to Place de Republique; we split up again. I return to the hotel and the others stop at the grocery for water and snacks for during the day. Waiting in the lobby is Julie, rested and relaxed. I sit down beside her and share our adventures of the day, just as I did years ago when I visited Paris as a young college student. Soon the others returned and we discussed plans for dinner. It was already close to six in the evening and we needed to clean up and refresh before dinner. We decided to meet at seven and make our way to the banks of the Seine. We would have dinner and ride the Bateaux-Mouches down the river at nightfall. 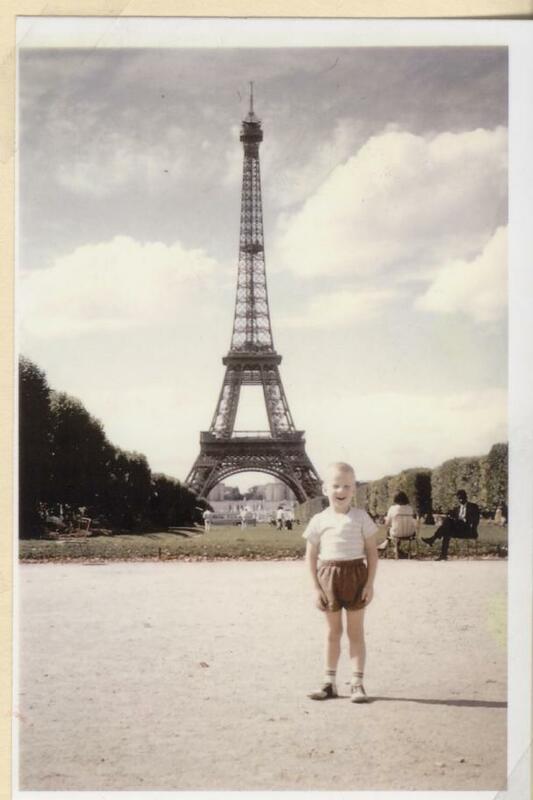 We were on Place d’ Alma on Avenue V and from our seats we could watch the see the Eiffel Tower. Across the road were the Bateaux-Mouches and the Seine. Dinner was good and the company made it even better. It is nice to sit and enjoy dinner together as a family talking and sharing the day and memories of dad. The time passed quickly and soon it was past nine. The sun was slipping away in the west and the clouds were taking on a pinkish glow softly coloring the city and Eiffel Tower. We finished and made our way to the river’s edge, boarded the bateaux or boat, and rode down the Seine toward Notre Dame. There was still sunlight but it was fading fast. Buildings were lit and the boat had lights to illuminate what we passed. A speaker blared describing what we were passing – first in French then English and Portuguese or Spanish. The ride was beautiful, seeing the buildings from the rivers perspective provided an entirely new view on Paris. The bridges, Notre Dame, and Musee D’Orsay were beautiful but words cannot describe the Eiffel Tower. Rising high above the city on the Seine bank, it is illuminated and seemingly lights the area and is visible from just about everywhere on our ride. Warren and I share thoughts as do Julie and I. David and Trish sit together and watch. The ride ends as quickly as it begins, though it was an hour it seemed quick. Walk when the ‘green man’ is lit! It is now past eleven and we are all tired. I am sure Julie is, too. The walk to the metro and home will not be far but we must cross several roads and wait for the green man to tell us to go. Warren suggests desert and we decide on a restaurant. It is good to share and reflect. The deserts are delicious and soon were on our way back to our hotel. The metro is still running and many people like us are headed home after a night out or perhaps home after work. We ride silently watching and thinking of the day behind us and the days to come. It has been a great day, possibly the best day ever. But, tomorrow promises to be a million and six times better. Today counted. It was fun visiting the old area with the brothers.